Fabian Fink has stated the point—operationally and intellectually, from where it should be possible to understand—if it could actually be understood—what a curved surface is, what quality of plasticity really means and how it has to be handled to touch the senses like a warm hand in action, moving through the room. Like a sculpture, a kind of a self-portrait (pp. 50, 51), which has been painted accurately, covered with a net of lines, holding an F in its hand: the letter and body are interacting. The letter has been carved, sculptured, a wooden letter, the initial ‘F’. The artist’s rich plateaus of work have been arranged star-like around the zero point of plasticity. Continually translating, the technics vary, the genre is changing. In the context of multimedia practice, coming from the extension of the definition of art during the second half of the last century, Fabian Fink has grabbed everything that can be formed, to get to this mysterious curve, the curved surface reaching into the room like a taut Zen bow in the three-dimensional sense of touching. 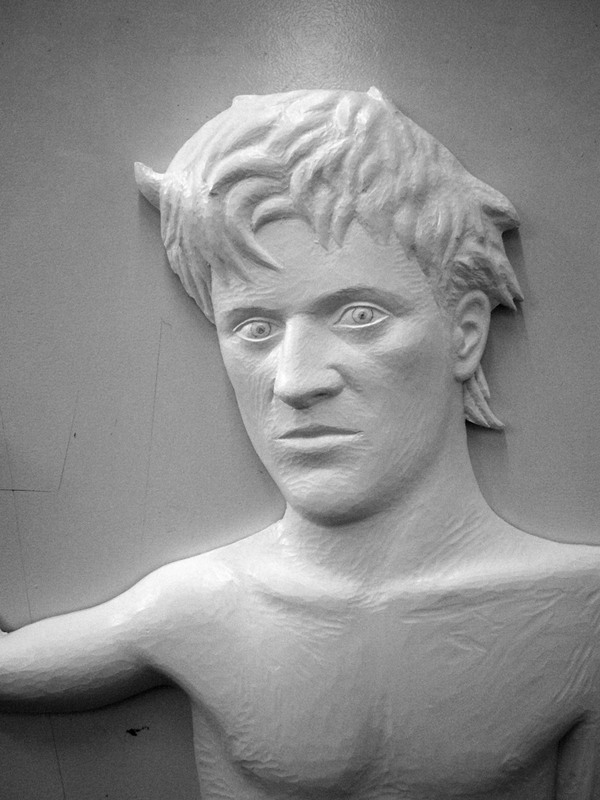 The last of his kind—an alumni of the sculpture faculty—has again become the first of his kind. 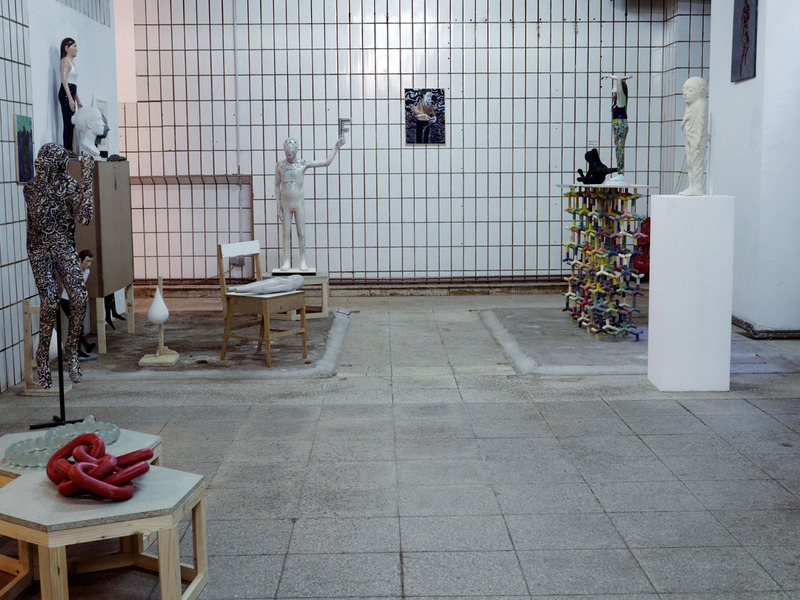 Fabian Fink will be interesting in measures, as contemporary art turns again to plasticity and the truth of material. The reference to the body in Fabian Fink’s figurative work is outstanding. In spite of this, it also deals with the “multimedia” by obtaining plasticity—as well as colour. 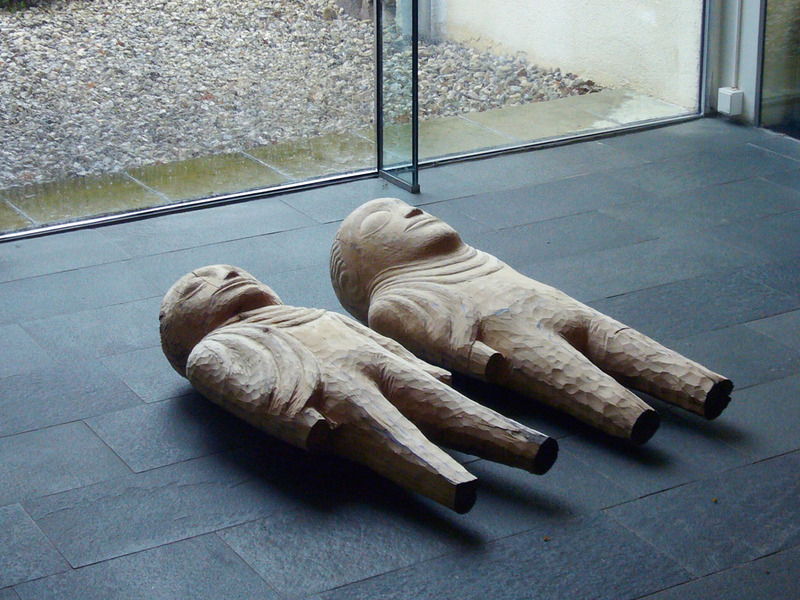 These qualities are present in all of Fabian Fink’s work whether sculpturing wood on a high level or in his dedication to casting techniques, creating furniture and other possible constructions. The range of his approach is impressive. 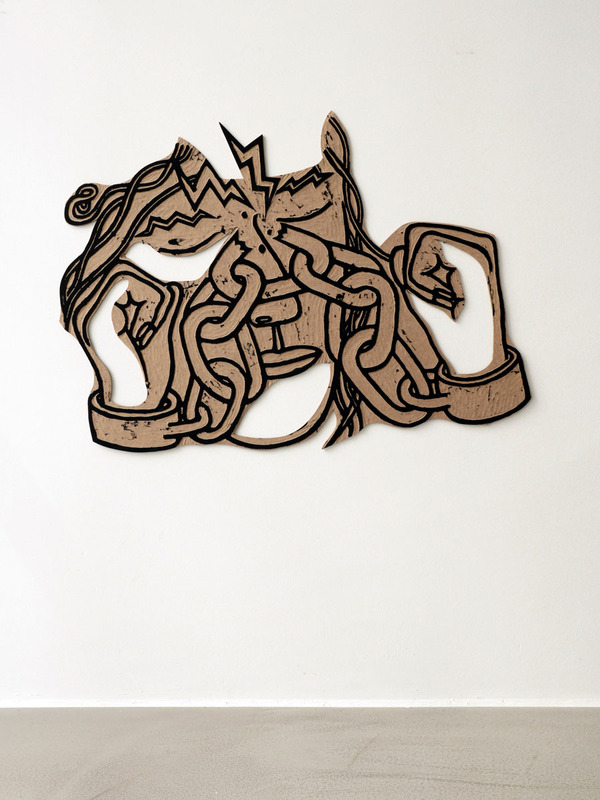 In an exhibiton in 2014 (“Ventura”, Galerie Jünger, p. 90), that presented an array of his work, one had the opportunity to see these many different approaches. One got the impression of a group exhibition. In a playful way the artist again and again made an attempt to solve a question as if he had had a group mission. There were huge wooden sunglasses, a cupboard, three-dimensional connecting parts consisting of colourful plastic elements, a pair of beautiful bronze hands, which seemed to have derived from Friedrich II’s castle, etc. 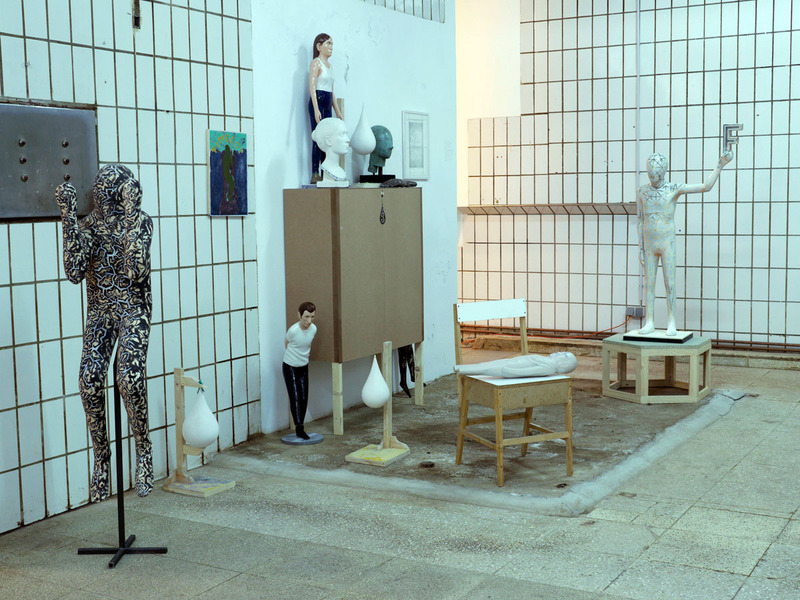 Concerning dissemination, Fabian Fink is extremly contemporary indeed, close to what this generation represents. Beside his works, that demonstrate his good academic education, e.g. the actor’s portrait as a perfect relief in the Burgtheater (p. 10), there are smaller colourful sculptures (cover, pp. 1–8) that certainly, on first impression, can be related to Balkenhol’s work. 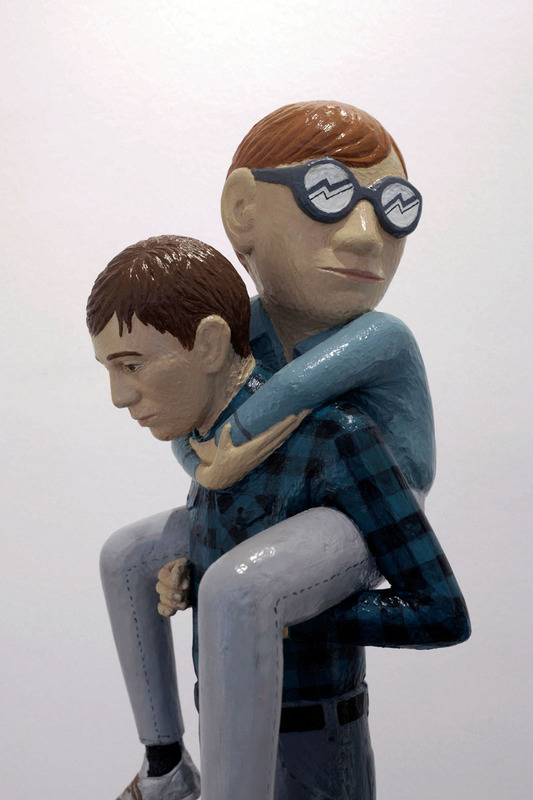 Both, Fink and Balkenhol are interested in contemporary figures, human beings. But even after a short look one can see the differences between both artists. Fink’s figures are different concerning scale, though small, but not miniature, more focused on the portrait. 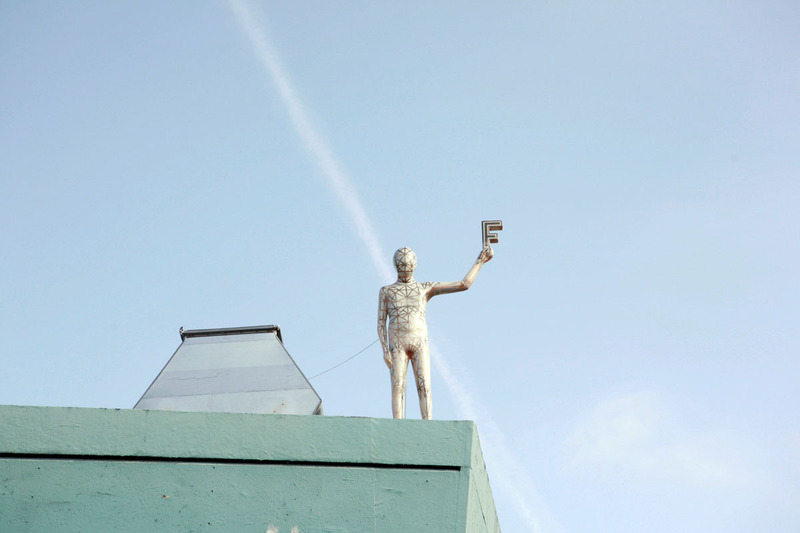 The painting of the sculptures is the result of an experiment conducted by Fink with his artist friends. While Balkenhol is not making such experiments, one can study in Fink’s work how radically the sculpture is changed by painting. 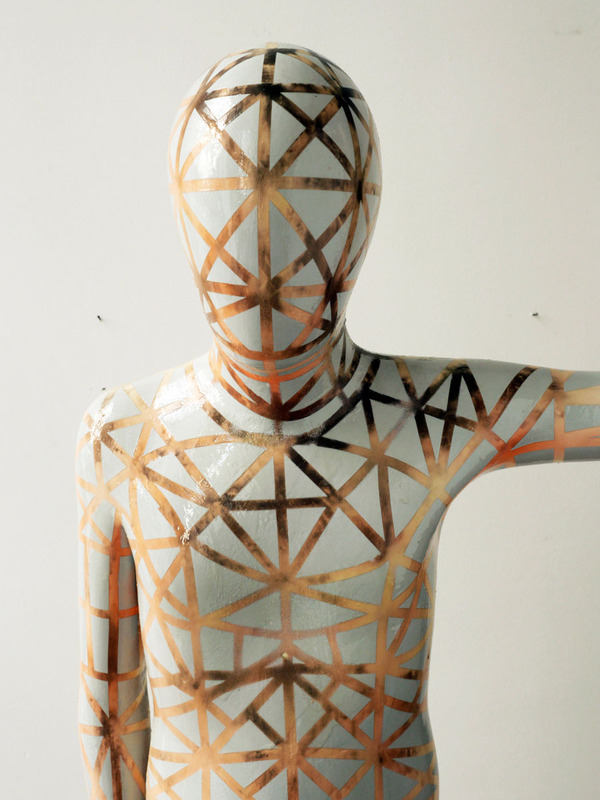 Some of these sculptures made of wood or plaster are white, revealing the beautiful shadows within the modeling. Others are dressed in youth culture couture, fantastically ornamented clothes, with hoodies and sport’s wear. One sculpture of a woman of average height, that reminds one of Masaccio’s “Eva”, has a spider’s web painted on it. On the one hand it is deconstructing the three-dimensional volume, on the other hand it seems to calculate it like digital data—a sculpture from a Rapid Prototyper. Many of these sculptures are strikingly smooth and well proportioned, as if they came from a young star inhabited by delicate creatures: fine lines in their faces which have been replicated in silhouettes, one sees they are created with tender care and much thought. Some of them are nearly doll-like—in a positive sense—where one can detect the many projections which have become part of the figurative sculpture. However, what these works dont have is strong and clear symbolism. 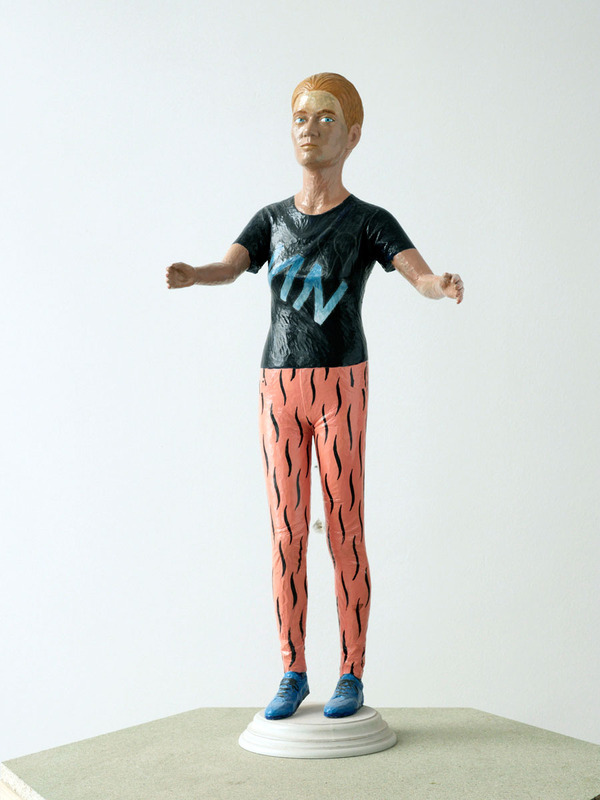 While sculpture relied on symbolism to proliferate in its long history, in Fink’s work there are no heroes or gods, no idols or heroines, but people, real people, specifically young people, who are extraordinarily well pictured. If they are not “real people” they become phantastic immediately, like the two stocky creatures that have large eyes like embryos (pp. 14), reminding you of strange cultures that do not exist. 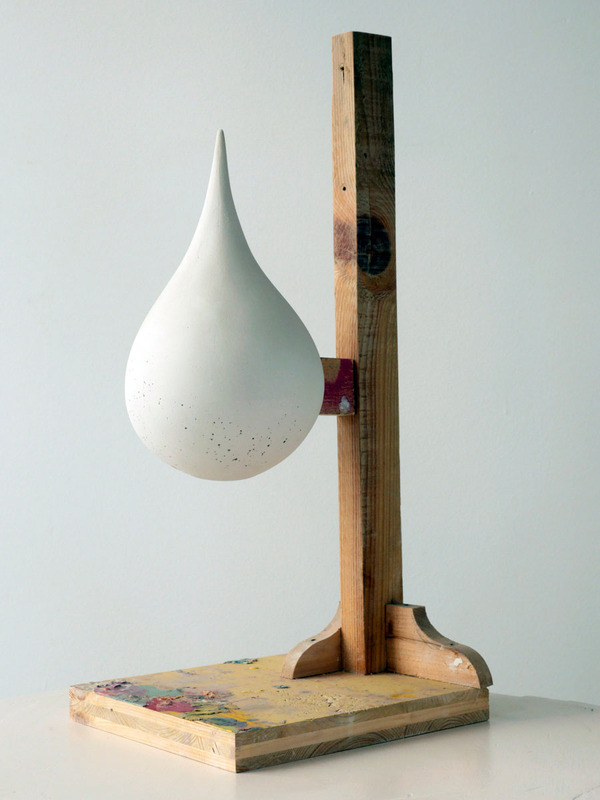 Others are objects where plastical studies are made in a special way, for example a drop of water made of plaster (pp. 20–23) put on a simple wooden structure. It shows the deformation of a ball caused by the power of gravity exercised on liquid—a basic fact of form. Standing in line, the water drops on their various supports resemble each other like two peas in a pod. Each drop has been portrayed as a singular, as a three-dimensonal happening. Just as an architect should also be an astronomer and a physician, a sculpturer who wants to colour his works has to be able to paint and to draw. Fabian Fink’s paintings are either related to his sculpting work or not. 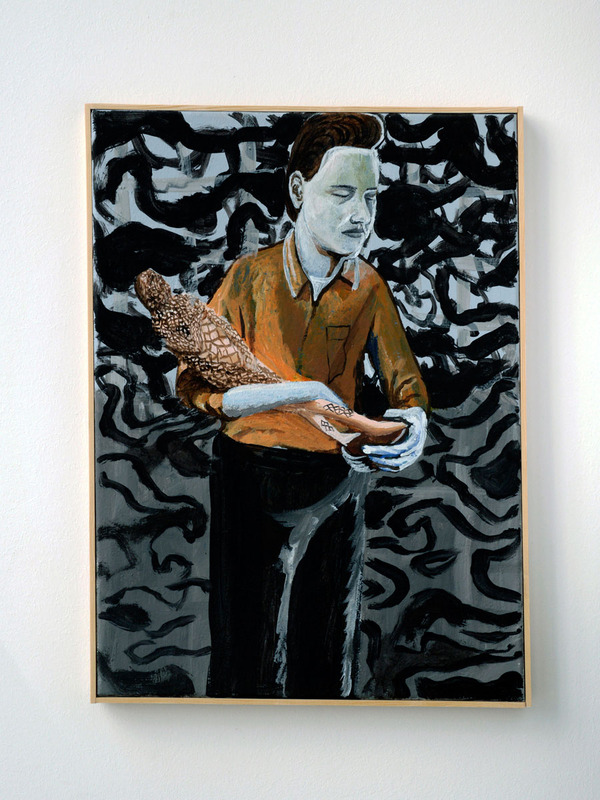 There is a painting for example (p. 25), where someone is holding one of Fabian Fink’s sculptures in his arms like a child. The synthesis of painting and sculpturing is a trans-facultative miracle, a media experiment of early art that wants to be interpreted in a new way in the post-digital age. His hand is skilled, easily crossing the fields of drawing, painting and sculpturing. The sketchy character of his drawings has its own attraction, coexisting clear lines, delicate hatching, sketches for sculptures where the pedestal has been kept in mind. 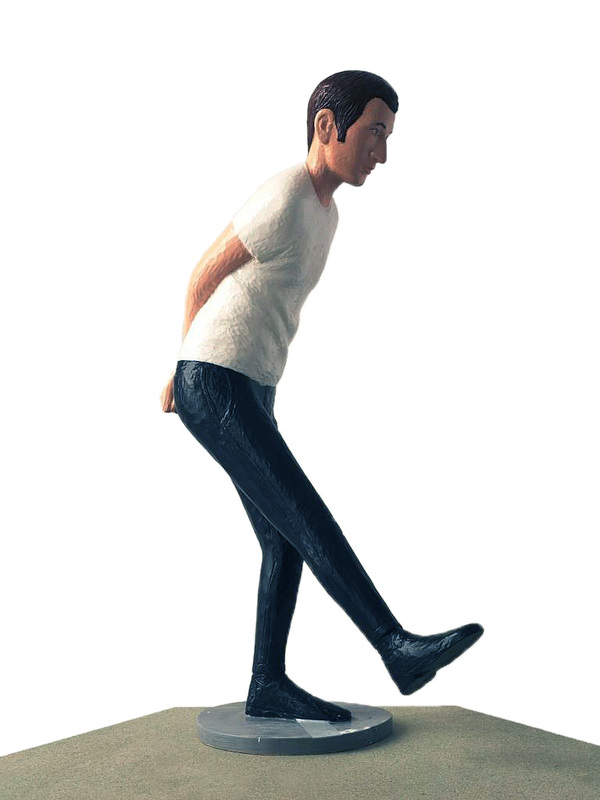 The positions of the sculptures can be traced in the drawings: a man lifting his foot coquettishly foreward pp. 46, 47 , a boy carrying another one on his back, one with an enormous head (p. 48). These drawings can become monumental as well, can turn into objects on walls with their specific format and their own boundaries pp. 60, 61 . The aim is to find the right line, drawings rich in contrast provide the model, appearing like graffiti. The lines are resting on a surface, defining the body, but showing the spatial relationship as an illusion of space, like crossed fingers or links of a chain p. 60. Fabian Fink has technically passed through a series of sculptural challenges you might know from ivory carving: what can possibly be done with a material is carried out to its extremes. 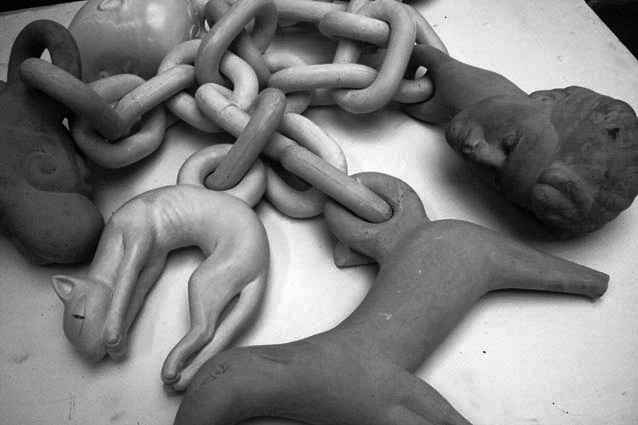 While ivory carving has produced volume nested inside one another like interleaved rotating balls, produced from the same block of material, Fabian Fink has turned to chains and their links, producing a charming chain with enormous charms p. 17: heads ending in big loops, the “Golden fleece” this time from a cat etc. For those who have been initiated in a three-dimensional sense, who know the problem, joy in space is understandable, based on the fact that chain links change their space orientation in right angles. So these connected chain links can be mathematically regarded as coordinated axes of a galaxy of non-linear nature. The furniture that arises from this rich workshop bears an individual handwriting between radical design and artepovera. They are neither snobbish nor flash in their ideas. They are lacking this certain “chichi” through which design often makes itself important. Among the grand line of furniture making contemporary artists, for example Franz West, Erwin Wurm and Heimo Zobernig Fabian Fink can easily claim the place he his entitled to as an inventor of the most fragile and useful forms.